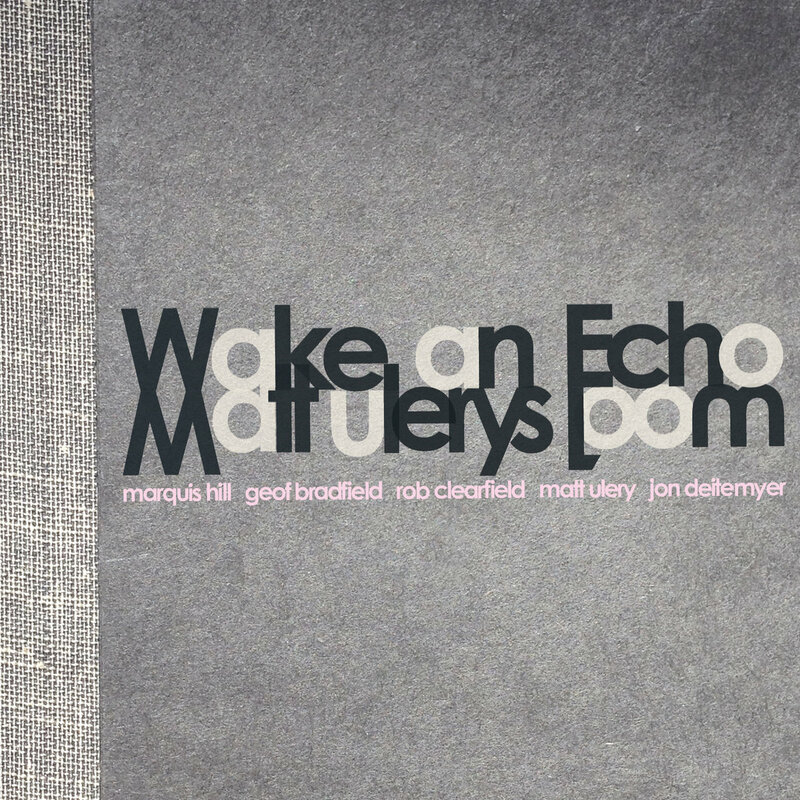 "Wake An Echo" (Greenleaf Music) is bassist/composer Matt Ulery's 6th release as a leader and second for Dave Douglas's exciting label. His previous CD, "By A Little Light", made numerous "Best Of" lists in 2012 (including mine) - this release finds him writing and playing with his Quintet known as Loom and I would not be surprised to see this among the "Best Of 2013" (including mine. The 7 tracks feature the bassist working alongside Geof Bradfield (bass clarinet), Marquis Hill (trumpet), Rob Clearfield (piano, accordion) and Jon Deitemyer (drums). Melodically, this is one of the strongest recordings of the year. Ulery writes episodic melodies, with phrases that connect the way sentences in a short story or novel do. Not concerned with flashy technical flourishes or long solos, these pieces unfold in surprising, intelligent and, often, fun ways. There is more than a hint of Steve Reich in the continual piano figure of the opening track "The Lady Vanishes" (not the soundtrack to the PBS "Masterpiece Mystery" presentation) yet the melody moves in, around and over the double-time repetition. The rhythm bounces in the fashion of Eastern European music but changes with regularity. Deitemyer's explosive drum work and the excellent piano work of Clearfield stand out yet make sure to pay attention to the work of the leader. Throughout the program, Ulery is the "foundation" of the music, setting up the "framework" for each track; sometimes he'll cede that role to the trumpet and bass clarinet (as he does during the melody section of "Carefree", even taking a rare - for him - solo) freeing the drummer and pianist to roam around beneath the soloists. One must listen to how gracefully all the elements come together on "Over Under Other" and take into account the various ways that Deitemyer influences the pace and intensity of the music. Hill and Bradfield (who normally can be heard on tenor saxophone - check out his impressive 2013 release, "Melba") complement each other throughout the program with phrases that overlap or weave around each other. Clearfield moves to accordion for "My Favorite Stranger", a tune with a melody that has the feel of one by Kurt Weill and has a splendid solo from Hill. For the final track, "All The Riven", Hill, Bradfield and Clearfield share the melody line for a ballad whose chordal patterns change as the piece picks up in intensity, ascending towards a solemn finish. It's emotionally charged yet stunning in its performance. "Wake An Echo" is music to be savored time and again; you can listen for the wonderful interaction of the trumpet and bass clarinet, to the expressive drum work, the excellent contributions of the pianist and the intelligent designs (no religious intent on the part of the reviewer) of Matt Ulery. This music needs "deep listening" - the rewards are many. For more information, go to www.mattulery.com. Alto saxophonist Jacob Duncan has arranged pieces for Bonnie "Prince" Willy, Little Jack Melody & His Young Turks and Ben Sollee. He has worked with the Lousiville Symphony, Aretha Franklin, Norah Jones and Debbie Boone. He is, also, the founder/leader/composer/arranger of Liberation Prophecy, a Louisville, KY-based octet that has just released its 2nd CD, "Invisible House" (Calvin Cycle Collective) and it's a wondrous surprise on several levels. Duncan wrote all the melodies and collaborated with Will Oldham, Greta Smith and Joe Manning - the music reflects a myriad of styles, from pop to avant-garde jazz and all areas in-between. Joining Duncan (who also plays clarinet, flute, and Fender Rhodes) is Steve Good (clarinet, bass clarinet, tenor saxophone), Chris Fortner (trombone), Kris Eans (trumpet), Michael Hyman (drums), Craig Wagner (electric and acoustic guitars) and Chris Fitzgerald (acoustic bass) plus the fine vocalist Carly Johnson. She has the power to front the band on the forceful "Tip Toe" and the sensitivity to handle the transition from gentle-to-strong on "Let's Not Pretend." The band can really soar, as they display on the opening track "You" and flirt on the edges of "free" music on the closer "Nova Vite" with its "Happiness Is A Warm Gun"-style second half. Duncan's handsome flute lines float over the band on the instrumental title track which also includes a "blowsy" trombone section for Fortner in the middle. The other all-instrumental track, "Consolations", has forceful drumming, impressionistic piano fills and a rousing melody line for the brass and reeds - it has the feel of mid-60's tune by John Coltrane. The leader's also sax is featured prominently on the lovely ballad "The Lazy Mist" blending Ms. Johnson's breathy vocal, quiet acoustic guitar and simple yet effective bass lines. "Invisible House" succeeds on many levels thanks to the vision of Jacob Duncan. The music has moments of warmth, of power, of subtlety and wit - Liberation Prophecy makes a joyous racket! For more information, go to www.liberationprophecy.com. The octet will be in New York City on August 19 to play 2 shows at the Blue Note Jazz Club, 131 West 3rd Street. For ticket information and more, go to www.bluenote.net/newyork/. I've had "December's Moon" (Palmetto Records), the debut CD by Ron Oswanski, on my desk for months, listened to it a number of times, even played a few tunes on the radio. Oswanski, who plays Hammond B-3, piano and accordion, utilized 6 different ensembles (with lots of overlap) to record these 12 tracks. Included in the mix are Tim Ries (soprano and tenor saxophones, co-producer), John Patitucci (electric and acoustic bass), John Abercrombie and Jay Azzolina (guitars), Clarence Penn and Ian Froman (drums). The material ranges from originals to inspired arrangements of works by Kenny Wheeler ("Kayak"), Fred Hersch ("Evanessence"), Led Zeppelin ("Rain Song"), Tim Ries ("Solo Por Undia") and Steve Meisner ("Ukranian Polka"). The varied program works in Oswanski's favor; he plays all his instruments with flair (like his smart accordion on "Ukranian Polka" and fiery B-3 work on "80-80-8") and gives his collaborators plenty of space to solo (Abercrombie is in fine fettle on his 5 appearances.) Penn's drumming is, as usual, mighty impressive but don't ignore the smart work of the Canadian-born Froman. Patitucci is his usual creative self, one of the more melodic of the contemporary bassists. "December's Moon" usually portends the chill of winter (at least, it does so in much of the Northern Hemisphere) but Ron Oswanski gives listeners a warm, even hot (at times), collection of music to enjoy. For more information, go to www.ronoswanski.com. Trombonist/composer/arranger/producer Wayne Wallace, a native of San Francisco, has been a mainstay of the West Coast jazz scene for 4 decades, working with Aretha Franklin, Pete Escovedo, Earth Wind & Fire, Max Roach and so many more. He's won 5 GRAMMY Awards, recorded 9 CDs as a leader, composed works for dance troupes, co-composed a soundtrack with Jon Jang and produced a number of fine recordings. In the Fall of this year, Wayne Wallace will join the faculty of Indiana University as a Professor of Practice in Jazz. His 9th CD, "Latin Jazz – Jazz Latin", has just been issued on his Patois Records label and features his Quintet of Murray Low (piano), David Belove (electric bass), Colin Douglas (drums) and Michael Spiro (percussion) plus a slew of special guests including the afore-mentioned Escovedo (percussion on the silky smooth "La Habana"), violinist Mads Tolling and trumpeter John Worley. Tolling shines on the sensuous "Melambo", blending his sounds with the trombone and fine flute work of Elena Pinderhughes. She and Tolling also star on the rousing "¡A Ti Te Gusta!" that opens the program. Wallace includes 2 songs associated with the Duke Ellington Orchestra including a bluesy take on "Things Ain't What They Used to Be" (great feel in the rhythm section plus a smoking trombone solo) and a bolero take on "Prelude To a Kiss." There's a rollicking version of John Coltrane's "Giant Steps" as well as medium tempo "bomba" take on Thelonious Monk's "I Mean You." Pianist Low is stalwart throughout the CD and takes a bluesy solo here. His piano lines dance from the keyboard, meshing perfectly with the active rhythm section. If you have a hankering for Latin music that will set you soul on fire and cause you to dance around the house, "Latin Jazz – Jazz Latin" is what you want. 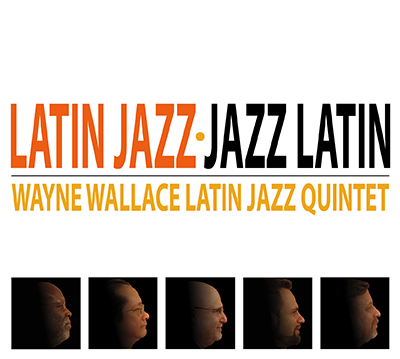 As he has done throughout his career, Wayne Wallace hits all the right notes, ably supported by his fine Quintet. Congratulations on his new appointment. For more information, go to patoisrecords.com.